Falling through the wintry night. And the miracles of old. Turning brown, they'll soon be done. Eva Grant has also written a lot of Hanukkah poems (do a Google search to find a thorough sampling), but they mostly fall into the extremely simple category I was complaining about yesterday. This one at least gives you a feeling of holiday domestic warmth, but it still feels like the scene and sentiment belong on a Hallmark card. The picture on the front would be pretty -- They could use cool toned colors to compare the cold snow with the sparkling menorah -- maybe they could even put some glitter on it. Inside, the colors would be warm -- there would be candle light on the awestruck faces of the children around the table listening to Grandpa while Grandma looks on fondly from her station at the stove frying latkes. Why is there such a dearth of good holiday poems? There are certainly enough lousy ones, so it's not like poets ignore the holidays. It seems to me that holidays are when emotion runs highest, and what is poetry but a way of expressing emotion? When I really think about it, I suppose that most of the good Christmas poems have been set to music, and there are PLENTY of Christmas songs out there. There are also a lot of poems appropriate for Easter, though most of them were written about Christ and his resurrection than the holiday itself. There's no shortage of love poems for Valentines day, or Irish poems and folk songs that can be used at St. Patrick's, but again, those were written about the thing the holiday is celebrating rather than about the holiday itself. I'd love to hear your thoughts on the topic. The best Hanukkah piece - not a poem - I heard this week was on an NPR special holiday broadcast. JTS Chancellor Ismar Schorch was being interviewed and explaining the history behind hanukkah. The interviewer commented that many Jews are trying to make the holydays more personally important: in what way was Hannukah personally important to the Schorch family? He was living with his family in Hanover Germany in 1938. Then kristallnacht (destruction of Jewish businesses, homes and synagogues in Berlin and other cities) happened on Nov 8-9. His father was a rabbi and was arrested and sent to a Nazi prison camp. Their relatives living in England quickly arranged for them to emigrate and paid to have his father released into English custody. Schorch said they celebrated the first night of Hannukah in 1838 in their partly destroyed home in Hanover. They celebrated the second night in London as a family. 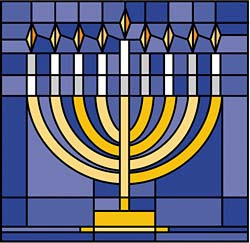 Hannukah became their OWN story of liberation and salvation, of being able to put the menorah in the window and proclaim to the world their Jewish faith, of dedicating themselves to justice and righteousness, of being a light in a very dark world. THAT would make a great poem, Karen. Go for it. Do you know the original source for Happy Hanukkah!? Bill Martin and I are using it in our new poetry collection and need to get permission. Nice post. I am also trying to do a post to include Hanukkah poems and came across Eva Grant. I've seen a quite a few of her poems online but I don;t see any information about her or an official site or something of that sort. Can you help me in that area?